Before you read the report, test your own Web IQ by taking the interactive knowledge quiz. The short quiz tests your knowledge of questions recently asked in a national poll. After completing the quiz, you can compare your score with the general public and with people like yourself. 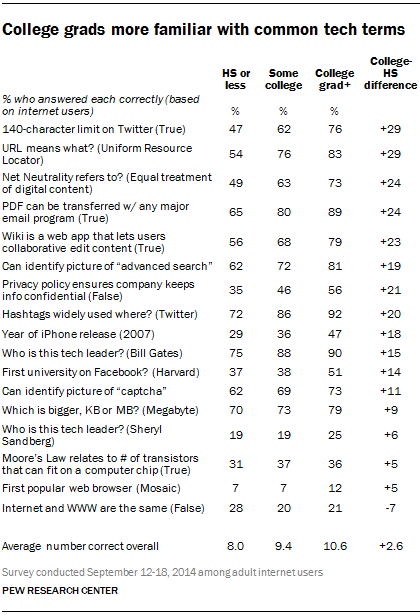 American internet users’ knowledge of the modern technology landscape varies widely across a range of topics, according to a new knowledge quiz conducted by the Pew Research Center as part of its ongoing series commemorating the 25th anniversary of the World Wide Web. To take the quiz for yourself before reading the full report, click here. 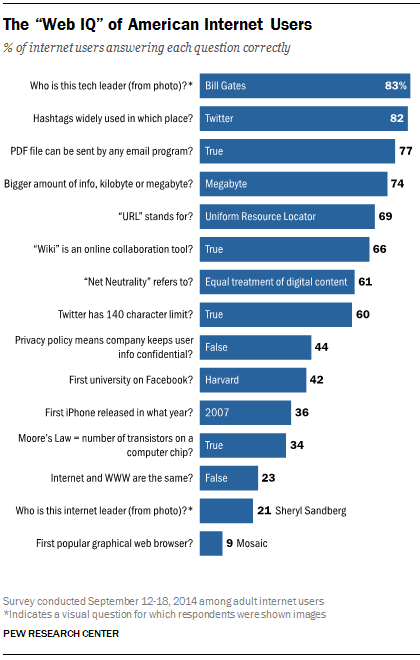 The survey—which was conducted among a nationally representative sample of 1,066 internet users—includes 17 questions on a range of issues related to technology, including: the meaning and usage of common online terms; recognition of famous tech figures; the history of some major technological advances; and the underlying structure of the internet and other technologies. Substantial majorities of internet users are able to correctly answer questions about some common technology platforms and everyday internet usage terms. Around three-quarters know that a megabyte is bigger than a kilobyte, roughly seven in ten are able to identify pictures corresponding to terms like “captcha” and “advanced search,” and 66% know that a “wiki” is a tool that allows people to modify online content in collaboration with others. A substantial majority of online adults do not use Twitter, but knowledge of Twitter conventions is fairly widespread nonetheless: 82% of online Americans are aware that hashtags are most commonly used on the social networking platform, and 60% correctly answer that the service limits tweets to 140 characters. On the other hand, relatively few internet users are familiar with certain concepts that underpin the internet and other modern technological advances. Only one third (34%) know that Moore’s Law relates to how many transistors can be put on a microchip, and just 23% are aware that “the Internet” and “the World Wide Web” do not, in fact, refer to the same thing. Many online Americans also struggle with key facts relating to early—and in some cases, more recent—technological history. Despite an Oscar-winning movie (The Social Network) about the story of Facebook’s founding, fewer than half of internet users (42%) are able to identify Harvard as the first university to be on the site; and only 36% correctly selected 2007 as the year the first iPhone was released. The Mosaic web browser is an especially poorly-remembered pioneer of the early Web, as just 9% of online Americans are able to correctly identify Mosaic as the first widely popular graphical web browser. When tested on their recognition of some individual technology leaders, a substantial 83% of online Americans are able to identify a picture of Bill Gates (although 10% incorrectly identified him as his long-time rival, former Apple CEO Steve Jobs). But just 21% are able to identify a picture of Sheryl Sandberg, a Facebook executive and author of the recent best-selling book Lean In. Americans also have challenges accurately describing certain concepts relating to internet policy. Six in ten internet users (61%) are able to correctly identify the phrase “Net Neutrality” as referring to equal treatment of digital content by internet service providers. On the other hand, fewer than half (44%) are aware that when a company posts a privacy statement, it does not necessarily mean that they are actually keeping the information they collect on users confidential. College graduates tend to score relatively highly on most Pew Research Center knowledge quizzes, and also tend to have high rates of usage for most consumer technologies. As such, it is perhaps not surprising that this group tends to do relatively well when it comes to knowledge of the internet and technology. 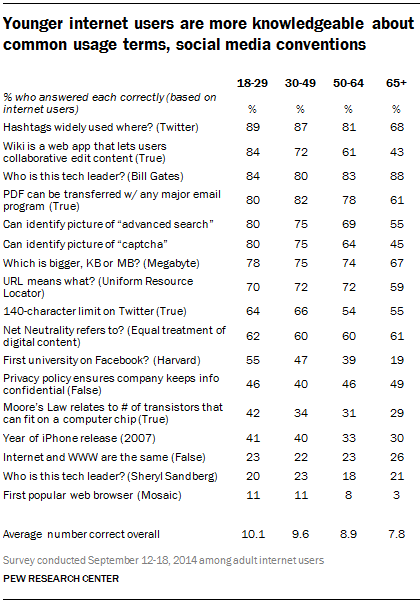 Compared with internet users who have not attended college, college graduates have much greater awareness of facts such as Twitter’s character limit, or the meaning of terms such as “URL” and “Net Neutrality.” Still, there are some elements of the technology world on which even this highly educated group rates poorly. For instance, just one in five correctly answered that the internet and World Wide Web are not the same thing, and only 12% know that Mosaic was the first widely available graphical web browser. Quiz: How much do you know about the web and digital technology?